and in the end of June 2007 in Italy and in France. The Directors of Barcelona Dance Awards, present the 18th International Competitions and invite your dance group to performing and teaching at the most prestigious dance events in Europe the next season. We kindly ask you to help us distribute our news through your electronic network or printing out and hanging our postage / news / material up at public places at your eventual dance hall or studio. We are looking forward to hear from your comments! 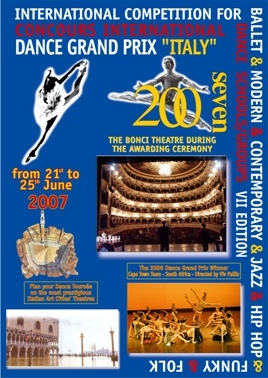 BARCELONA DANCE AWARDS 2007 & DANCE GRAND PRIX ITALIA 2007! Come with us to our next step: Travel, Dance, Compete, and enjoy the best WorlDancEventS in Europe. I'm inviting the "Dance Directors" who are willing to invest in themselves and who are interested in expanding their knowledge of other cultures, as well as promoting their work abroad, says Mr. Barbieri I'm looking for "Dance Groups" who see this thrilling event as an opportunity to benefit their professional development. 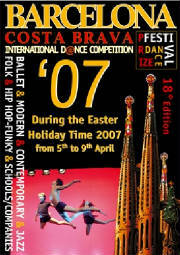 On THE NEXT EASTER WEEK 2007 many Dance Groups will dance in EUROPE (SPAIN)...and you? Dance Grand Prix Festival Competition Fringe, being held in Spain 5th to 9th April 2007 (during the Easter Holiday Time). In addition, the "Dance Directors" will have an opportunity to network and attend all performances by groups from all over the world. To find out how to qualifye mail the office space is limited, so "Dance Directors" should act right away. ONLY A LITTLE FEE TO PARTICIPATE!!! and compete and win the awards with the own performances. The Dance Grand Prix Festival literally draws thousands of people from all across Europe, and other parts of the world, the festival is a thrilling extravaganza of hundreds of artists performing dance, theater and music within awonderful aod stage theatre near the famous Spain Art Cities, courtyards, outdoor cafes and the hotel accomodations on the beach of the Brava coast this truly promises to be an unforgettable experience. Choreographers, dancers and chaperones will receive hotel three star accommodations in twin/three beds rooms with bathroom/shower,based on two/three persons sharing a room. We provide an entire and complete production package which includes excellent theaters, lighting, sound, technical assistance, publicity, pre-show rehearsal arrangements, and printed programs and posteer advise all over the city. Our managers will meet your dance groups on the "Welcome Bus Service" in the meeting pointe airport. I look forward to your participation and I hope to see you at the next festival. Have questions? Please email me <internazionaldance@tiscali.it>.